A fragment of the Nakhla meteorite. The Nakhla meteorite was an achondrite which exploded over the Egyptian town of El Nakhla el Baharia (31° 19' N, 30° 21' E), at about 9 a.m. on June 28, 1911, breaking into about 40 fragments, one of which allegedly (though this has never been proved) killed a dog. About 22 pounds (10 kilograms) of the meteorite were recovered by witnesses. The Smithsonian received two samples of the Nakhla meteorite the following August and then acquired a larger 480 gram (one pound) piece in 1962. By the 1970s, the Smithsonian had collected a total of 650 grams (1.4 pounds) of the meteorite. 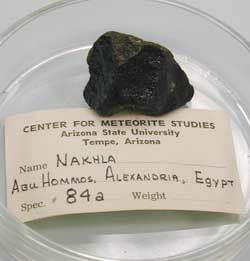 The Nakhla meteorite was later identified as belonging to an exclusive group of objects, known as SNC meteorites, a subgroup of which is the nakhlites, which are believed to have come from the surface of Mars. The igneous rock, rich in augite, of which the Nakhla meteorite is largely composed has been dated at 1.3 billion years. However, based on the age of clay found inside the specimens examined, it is thought that this rock was exposed to water about 600 million years ago. Through analysis of the rock's crystallization ages and crater-count chronology of different regions on Mars, the Nakhla meteorite most likely formed in the ancient volcanic regions of Tharsis, Elysium, or Syrtis Major Planum. Was the dog story a myth? The fearful column which appeared in the sky at Denshal was substantial. The terrific noise it emitted was an explosion which made it erupt several fragments of volcanic materials. These curious fragments, falling to earth, buried themselves into the sand to the depth of about one meter. One of them fell on a dog ... leaving it like ashes in a moment. Whether a dog was hit or not, it seems highly unlikely that it could have been reduced to ashes. Meteorites are often cool by the time they fall to Earth and certainly not hot enough to cause such extreme incineration. One of the fragments of the Nakhla meteorite, a well-preserved 12-centimeter-wide specimen, in 1999 joined ALH 84001 at the center of an intense debate concerning the nature of structures said by a team of NASA researchers to be the remains of microscopic martian life. In February 2006, new evidence emerged that the Nakhla meteorite might contain evidence of past martian life. In a sample of the meteorite held by London's Natural History Museum, researchers found a carbon-rich substance filling cracks within the rock. 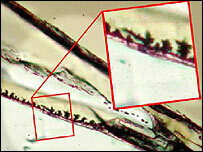 The material resembles that found in veins apparently etched by microbes in volcanic glass from the Earth's ocean floor. Initial measurements suggest that the carbonaceous material did come from Mars and is not contamination from Earth. The research team includes members who brought evidence for microbial life in ALH84001. Details were presented at the 37th Lunar and Planetary Science Conference in March 2006 in Houston, Texas.